The Baby Touch series was created by Ladybird books in 2005 and since then a number of books in the series have won awards. They are popular with both parents and educators for their bright, simple graphics, the variety of textures, the peekabo holes and the dialogue that they invite between parent and baby. The Ladybird website suggests they are aimed at ages 0-2 but different books will be appropriate at different stages of that journey and with different children. This is more suitable for younger babies but is a good first word book. 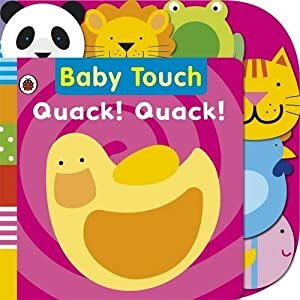 The animal tabs are a brilliant way to encourage babies of around 6 months and older to turn the pages themselves and the smiley faces of the various animals are very positive. Each double page has a group of animals on the left with names and some noises, and a larger picture on the right with a textured area to touch. The animals are grouped roughly into jungle animals, farm animals, sea creatures, pets and garden animals so will help babies starting to establish a sense of groups and categories. The text clearly aims to encourage interaction between reader and child and to develop basic social skills. Next to each tab is a little conversation. “Hello, Lion. Roar!” “Miaow! Miaow! Hello, cat.” (I would like to award bonus marks for the proper spelling of miaow, which is satisfying!) There are also built-in ‘instructions’: “Feel her soft wings”; “Baby, say “Ooo-ooo,” like a monkey.” This is great for those who are not so confident with reading as in encourages the kind of talking that helps children develop language skills. However it does come across as slightly patronising. This is a hard book to read as it leaps about all over the page and its non-linear approach makes it hard to work out what to read next. Not one for children who like their books read the same way every time as you could never possibly remember! That said, it means there is a lot to explore and would make this of greater interest to slightly older toddlers and perhaps even those of two years plus. There is no real theme to the book but there are some flaps, some nursery rhymes, some shapes, some textures, some holes and some animals to say hello to. As the name suggests there are good things to play about with; plenty of things to count, for example, and various learning opportunities such as the colours of the rainbow, the basic shapes and some animal names. Some things are very irritating, however. For some reason the ‘tall’ flower (which is fun as it has a mirror at the top) is paired with a ‘small’ one, instead of a ‘short’ one. Only half of Twinkle Twinkle Little Star is printed in the book. The garden snail rhyme is, I think, printed wrongly. There is a disembodied baby face which follows you disconcertingly from page to page and the final group of touchable textures makes a spurious distinction between ‘fluffy’ and ‘soft’. The flaps, too, are poorly designed; they attach at very narrow points and are too easy for enthusiastic babies to rip. Although you can see the premise behind this book and the play it attempts to encourage through its diverse choices of text and graphics on each page, the actual effect is too bitty and bewildering. Young babies would simply be too distracted by the number of pictures in front of them, and for older babies the concepts are not really developed enough to make for useful learning. This is an original way of presenting a rhyme book. It contains five classic nursery rhymes with a large bright picture on one page and some porthole pictures on the other. The idea is that children should spot the little pictures in the larger one – particularly good fun as some are furry! 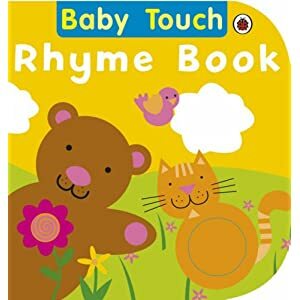 The nursery rhymes are suitable for all ages but the picture spotting gives this book some longevity, or an activity you can do with an older sibling whilst reading to the baby. Overall this series has many positives. A lot of thought has gone into each book and although the Playbook is not convincing all three have been enjoyed. They encourage active reading and discussion between parent and child and are (for the most part) big, bright and sturdy. 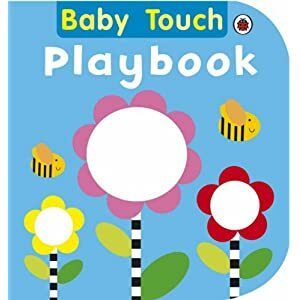 Certainly it would be worth looking at other Baby Touch books to find ones that would suit your child. What they do lack, however, is charm. The pictures, by Fiona Land, feel like graphics, not illustrations, and to be honest the identically bland smiling faces become irritating very quickly The learning feels a little forced, as if designed by committee (which it may well have been) and everything about them is just a little too obvious. Excellent beginner books for babies that you can pick up and put down and leave with them to play about with. Should probably be avoided with older toddlers who would be better served by books that develop their vocabularly in more interesting ways and introduce them to narrative.